iOS 8 introduced actionnable notifications: action buttons can be attached to notifications. 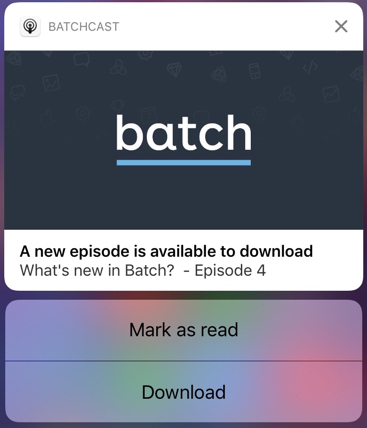 Batch includes support for them: this documentation describes how to make the best of Batch's features and how to integrate them with iOS' native features, including how to work with the new iOS 10 APIs without breaking backwards compatibility. This guide has no intention of being a full replacement of Apple's official documentations of notification actions. Note: Features described here require Batch 1.7 or higher. In order to be able to use action buttons in your notifications, you will have to register them to the framework in the application itself. To do so, you'll create Actions and group sets of them into Categories. Categories are what iOS will use to display a set of predefined buttons in local or remote notifications. It is important that you figure out what categories you will want to associate to your notifications as updating them will require you to submit an updated build to the App Store and have your users update your app before you can push with your new actions. An identifier. Your app will be called back with this identifier once the user tapped on the action so you can perform the action. A label. It is the text that the user will see. You can delcare these actions using the standard Apple UIKit documentation iOS8/9 / iOS10. You can also use the native UIKit APIs to register them, as per Apple's documentation. Note: You'll find an example implementation in Swift here in our Batchcasts sample project. It handles iOS 8/9/10 API changes and registers multiple actions in a category. If you're using the UserNotifications framework, iOS will call you back in your UNUserNotificationCenterDelegate instance you've set as the UNUserNotificationCenter delegate. As most legacy notifications callbacks, iOS will call you back on your app delegate. You'll need to implement application:handleActionWithIdentifier:forRemoteNotification:withResponseInfo:completionHandler:. A great way to clean up your code is to use Custom Actions and link them to your action buttons. It allows you to share code between the legacy and new callbacks, but also make your actions available to Mobile Landings and any future feature that will support calling actions you've defined remotely. Once you've created your Custom Actions, make sure you register your UNNotificationAction instances with the same identifier as the ones you've picked for your Batch Custom Actions. Starting with iOS 10, Apple has deprecated UIUserNotificationAction and related classes in favor of UNNotificationAction. Applications compatible with iOS version lower than iOS 10 will have to deal with compatibility. Using the right API depending on the OS version your app is running on. Using UIUserNotificationAction regardless of the OS version using Batch. If you're using Batch to register for notifications rather than UIKit methods, switching to the new UserNotifications framework has already been done for you. Calling BatchPush.registerForRemoteNotifications(<Categories set>) with legacy (UI*UserNotification) actions and categories will cause Batch to convert them to UNNotificationAction and UNNotificationCategory instances and use the new APIs transparently. If you define categories with both Default and Minimal contexts for your action sets, Batch will complain in the logs, as this doesn't exist anymore with the new APIs. A long term fix is to migrate to the right API according to the iOS version you're running on, as described earlier. Using UIUserNotificationAction regardless of the OS version using UIKit methods. Registering notifications this way is supported by iOS, but should not be used: You should use the UserNotifications framework on iOS 10, since the old APIs have been deprecated. You'll also have better callback support for anything related to notifications in your app.